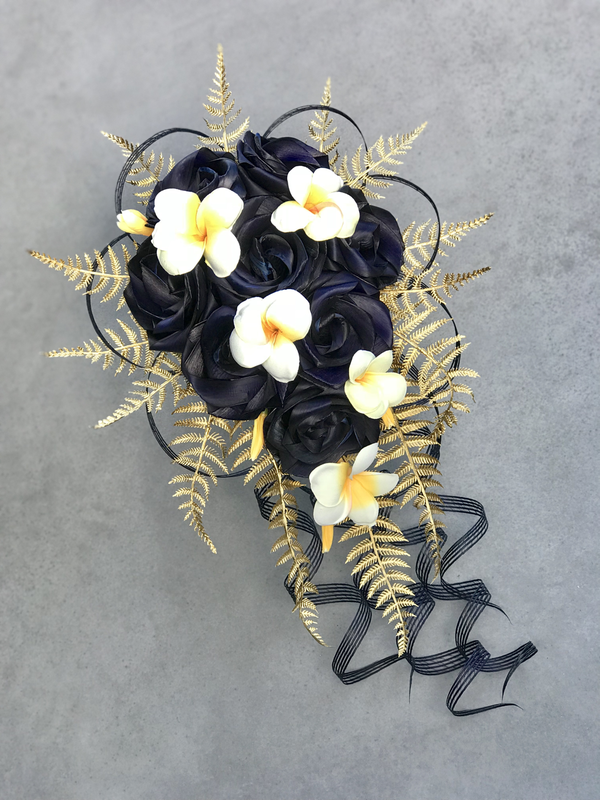 Waterfall Frangipani bouquet in navy with gold ferns $190 NZD. 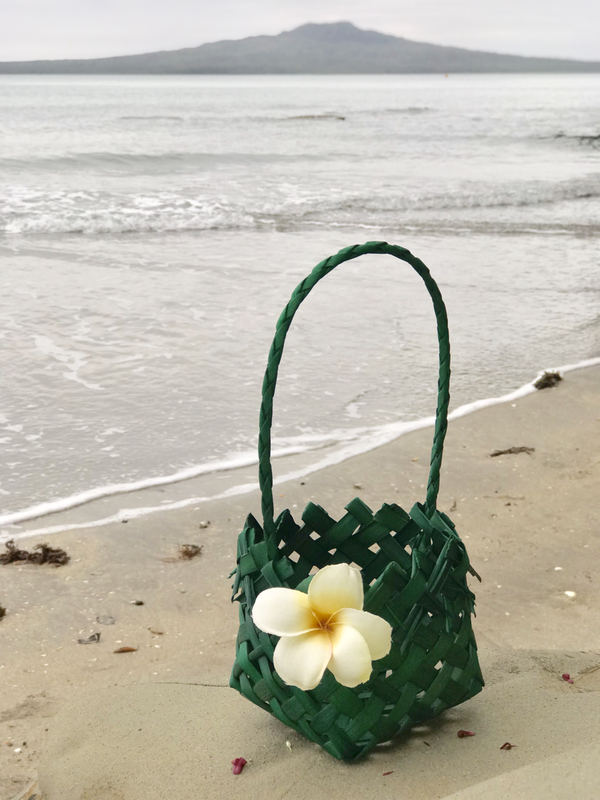 Hand woven petal basket in emerald with Frangipani $60 NZD. Large bridal Rainbow posy with natural buds & trailing loops $190 NZD. These include our large multi-coloured flax flowers. Bridesmaid seven flower Rainbow posy $90 NZD. These multi-coloured flowers can also be used to fit individual themes. Imagine a sunset bouquet or an ocean bouquet. Please talk with us about your requirements. Multi coloured rainbow buttonholes $20 NZD each. 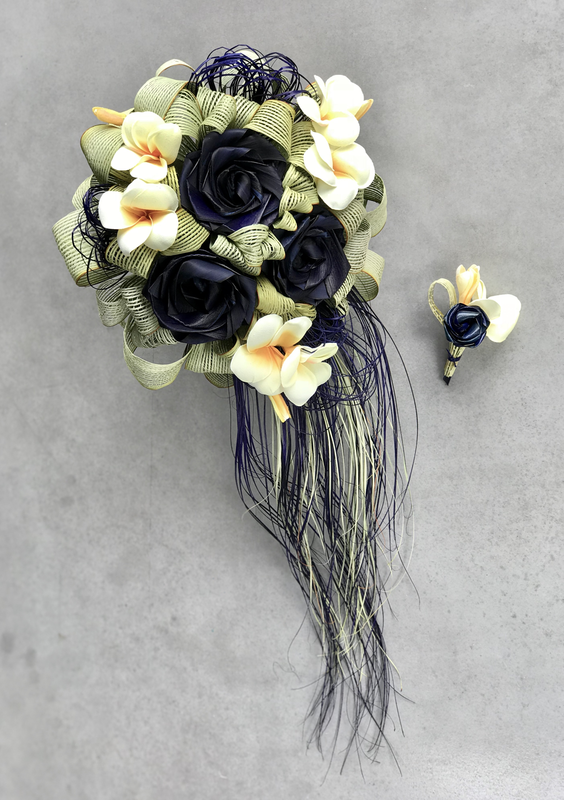 Frangipani Lacey bridal bouquet $190 NZD. Deep blue flax roses with natural netted loops & imitation Frangipani flowers. Grasses are also made from flax. Frangipani Lacey buttonhole $20 NZD. Kina bouquet in pale pink & ivory with pearl and natural grasses. A soft beach wedding style. 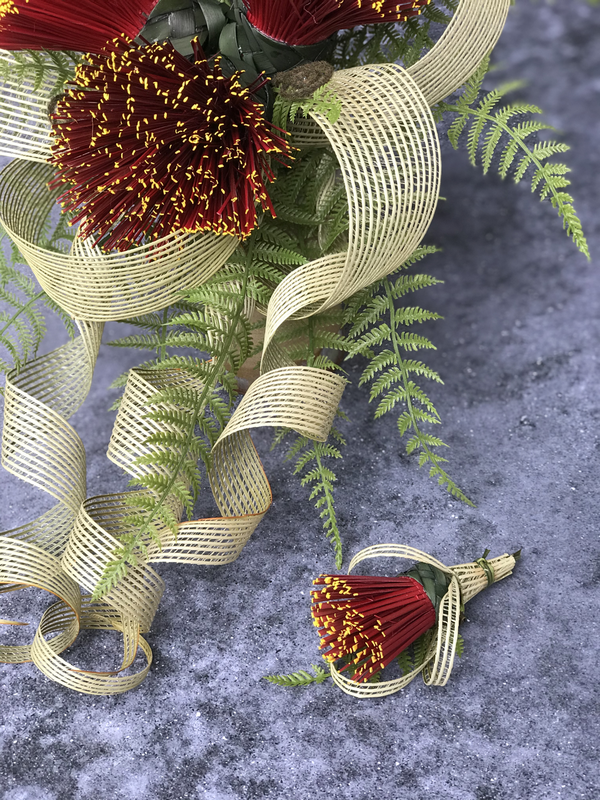 This client chose to have the stems wrapped in hessian. Matching brides bouquet is doubled in size with three Kina shells and pearls. 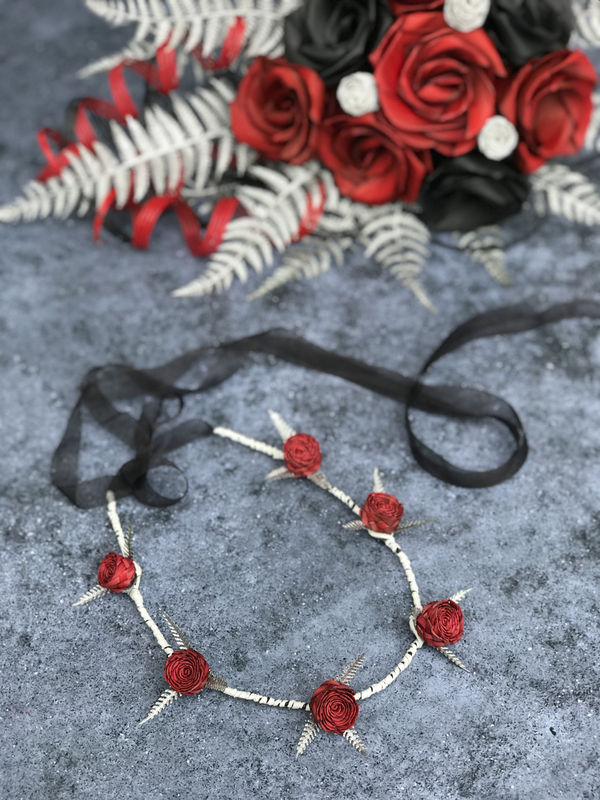 Bride $180 NZD. Paua ring holder with Frangipani $50NZD. Frangipani & shell halo’s $40 NZD each. 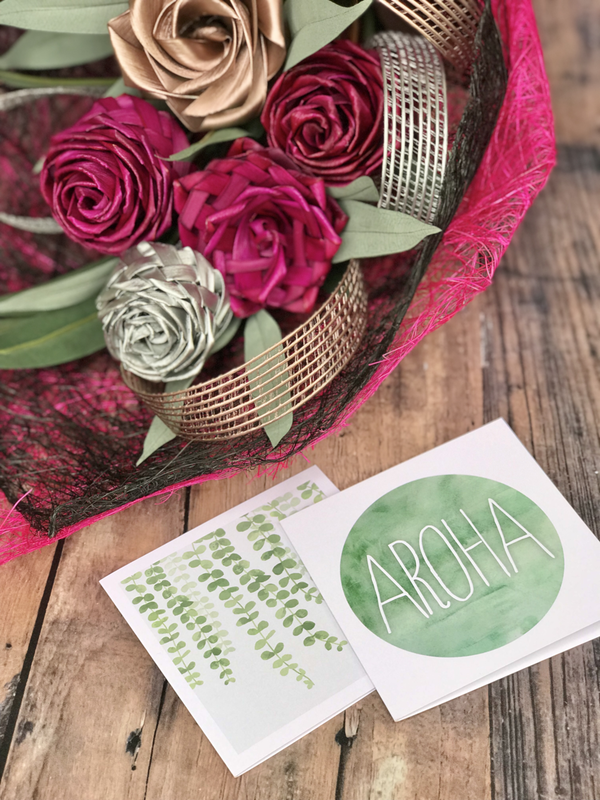 Bridal Aloha posy bouquet $180 NZD. A mix of flower styles in natural & baby blue with large netted natural loops and imitation frangipani.